Bali's luxury resorts are world famous for their exquisite settings, superlative facilities, hospitable employees and attentive service catering to your whims. Bali has many luxury resorts. Below are the best of the best. Ubud area. 40 villas, each with built-in privacy. The Amandari is designed like a traditional Balinese walled village. Overlooks a spectacular rice terrace gorge. 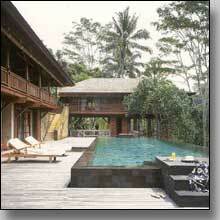 Resort and spa in the beautiful Begawan Giri Estate in the Ubud area. It's Bali's ultimate villa resort/spa seclusion spot. Peaceful garden park setting. On Jimbaran Bay. Directly on a beautiful, uncrowded beach. Terraced on steep hillside overlook sea. Located near Candi Dasa. On hillside overlooking Indian Ocean. Has private beach. In the general Ubud area. Most rooms have great Balinese scenic views. Hotel resort in the general Jimbaran area. A joint venture Bulgari and Ritz-Carlton. One of Bali's newest luxury hotel resorts. Beach front. In Nusa Dua. On Jimbaran Bay. Mammoth pool. Justifiably boasts the widest and finest beach front among the luxury hotels. Hotel resort. On Jimbaran Bay cliffs overlooking the Indian Ocean. Refined personality. Professionally landscaped.